Earlier this week, Martin Scorecese's documentary was released on DVD and Blue-ray. 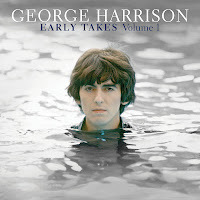 George Harrison: Living in the Material World takes you on a journey through George Harrison's life. A lot of it is told in his own words and of course through the those that knew him. Also, available is a companion music collection containing unreleased works by Harrison. The collection, Early Takes Volume 1 offers up demo versions and other unreleased material. Martin Scorsese’s GEORGE HARRISON: LIVING IN THE MATERIAL WORLD, which premiered on HBO last October, is getting a proper release on May 1st. Universal Music Enterprises will be releasing the film on DVD, Blu-ray, and a Deluxe Edition that will include the DVD, Blu-ray, special packaging and a 96-page book of photography to accompany the film. The film focuses the imaginative and inspired eye of one of cinema’s most pre-eminent filmmakers on one of the world’s most influential men. The film takes viewers on the musical and spiritual voyage that was Harrison’s life, much of it told in his own words. The result is deeply moving and touches each viewer in unique and individual ways.